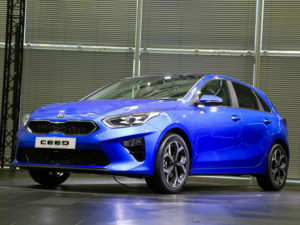 Kia has unveiled its third-generation Ceed hatchback, which introduces new engine and driver assistance technologies to bring the fight to the Focus and Golf. Due to start European sales by the end of Q2, the model is expected to account for an even greater proportion of Kia’s European sales. Kia expects with sales to ramp up from more than 472,000 units in 2017, to more than 500,000 vehicles in the medium term. Petrol options include an updated 118bhp 1.0-litre T-GDi engine, as well as a new 138bhp ‘Kappa’ 1.4-litre T-GDi, which replaces the earlier 1.6-litre GDI. Additionally, a 98bhp 1.4-litre MPi engine will also be available. The Ceed is also available with either a 113 and 134bhp ‘U3’ 1.6-litre CRDi diesel engine and is equipped with Selective Catalytic Reduction (SCR) active emissions control technology; producing an expected sub-110g/km CO2 on the new WLTP test cycle (after conversion from NEDC). Every engine will be paired with a six-speed manual transmission, while the new 1.4-litre T-GDi and 1.6-litre CRDi engines will also be available with Kia’s seven-speed double-clutch transmission. A Drive Mode Select system will enable owners to tailor their driving experience, with Normal and Sport modes. Standard technologies include full Bluetooth smartphone integration, as well as automatic lights and keyless entry. A new ‘floating’ infotainment system is available with either a 5- or 7-inch touchscreen audio system, or 8-inch touchscreen navigation system. A first for any Kia sold in Europe, the Ceed is available with Lane Following Assist, a ‘Level Two’ autonomous driving technology. Michael Cole, chief operating officer for Kia Motors Europe, said: “The Kia Ceed has been a lynchpin in the brand’s consistent growth across Europe for more than a decade. Created for European buyers, the introduction of the Ceed in 2006 represented a watershed moment for Kia. Lower, wider, and with a longer rear overhang than the car it replaces, the new Ceed is claimed to be a more ergonomic space and a larger 395-litre boot, as well as greater shoulder room for rear passengers, more headroom in the front row, and a lower driving position. The Ceed will be covered by Kia’s seven-year, 100,000 mile warranty as standard.